chinese stir fry vegetable recipes. Stir-frying is a famous Chinese cooking technique which involves cooking the ingredients quickly in a hot wok with very little oil. This helps in maintaining their original texture and flavor. The aroma that arises while cooking a myriad of ingredients is simply irresistible. Basically, cottage cheese, veggies or sprouts are cooked partially, so that they have a uniquely crunchy texture. Stir-fries may be dry or saucy and when seasoned with peppy spices or tossed with tangy sauces result in lip-smacking dishes. Hot Garlic Sauce, Chilli Garlic Sauce and Schezwan Sauce are popular spicy Chinese sauces that work well to toss vegetables and make Chinese Stir Fry Vegetables. If you are looking for a sweet and spicy sauce then Honey Chilli Sauce can be used to whip up amazing oriental delights. Stir Fried Rice in Honey Chilli Sauce is filling and very tempting with a range of textures from spring onions, broccoli, zucchini and cottage cheese. Handful of ingredients like butter, ginger-garlic , spring onions, sesame seeds, peanuts, soy sauce can help you create tongue tickling delights like Stir- Fried Paneer, Broccoli and Baby Corn, Mongolian Stir Fry, Mixed Vegetables with Sesame Seeds. Feel free to throw in the stocked veggies and clear your pantry! Stir fries are quick to prepare and also, very healthy. This authentic Chinese Stir- Fried Vegetables is a guilt-free one-dish meal that provides just 58 calories, along with being a good source of protein, vitamin C and fiber. Stir Fried Chinese Greens with the goodness of pak choi, bean sprouts and spinach tossed with creamy Chinese white sauce is a very well-balanced and flavorful dish. Stir-fries like Potato, Mushroom and Capsicum Stir Fry or Stir Fried Paneer, Mushrooms and Capsicum can be served as appetizers. The vivid blend of flavours and textures is a real treat for taste buds. Chinese Stir-Fried Vegetables can be had along with Hakka Noodles or Chilli Garlic Noodles to make them a perfect meal. Sumptuous stir-fries like the Spicy Stir Fry Noodles in Schezuan Sauce or Stir Fry Noodles in Black Sauce can also be had as it is for a meal. Add fun to your day by adding a stir-fry to one of the meals! 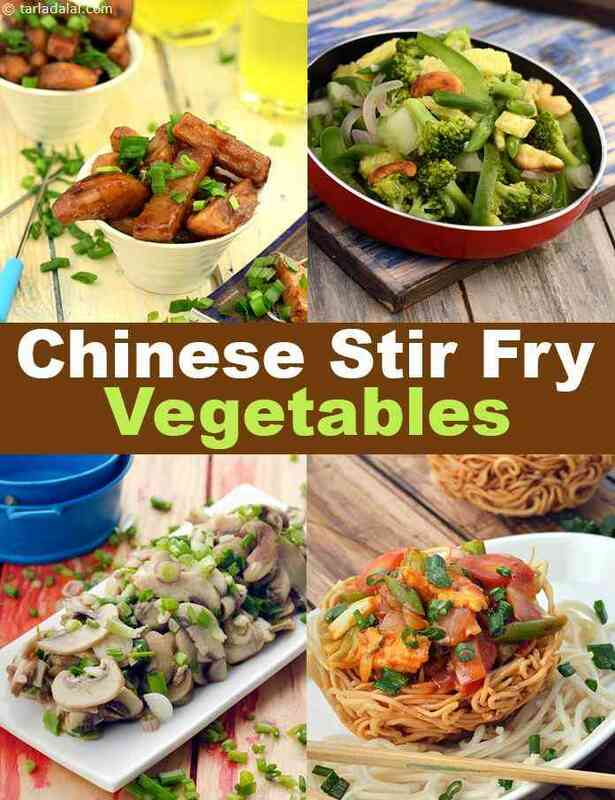 Enjoy our Chinese Stir Fry Vegetables Recipes given below and other Chinese recipes articles. Chinese cooking stresses the importance of colours and textures and for this reason the chinese consider cooking, to be an "art". This dish fulfills all the criteria. It is colourful, has plenty of interesting textures and of course flavours that, i am sure you will enjoy. For water chestnut lovers this is the best way to eat them clean and healthy as they are stir fried in olive oil with garlic and chilli flakes. The garlic and chilli flakes coat the water chestnuts really well to give a nice garlic flavor.